HomePublic Debt & Public Debt MoratoriumProtest outside Detroit Emergency Manager’s private meeting with City creditors – Friday, June 14, 2013, 9:00 a.m.
FRIDAY, JUNE 14, 2013, 9:00 a.m.
Driving from Detroit — take I-94 W to Merriman Rd. South Exit 198 toward Metro Airport. Follow signs to McNamara Terminal (stay to left after entering airport). At McNamara Terminal, exit at Departures, Westin Hotel, Short Term Parking. Enter Short Term parking on the left. Hotel entrance is on the right, just past Delta departures. Short term parking is $7.00 for 1.5 to 2 hours. Call 313-680-5508 for any questions. STOP DEBT SERVICE to the BANKS that DESTROYED DETROIT! See EM Orr’s letter to creditors, sent from JONES DAY! Demand a Moratorium (halt) on payment of billions of dollars in debt service “owed” by the City to the banks! Fight to restore services, end pay cuts to City workers, protect pensions, stop union busting, and keep City assets from the DIA to Belle Isle! 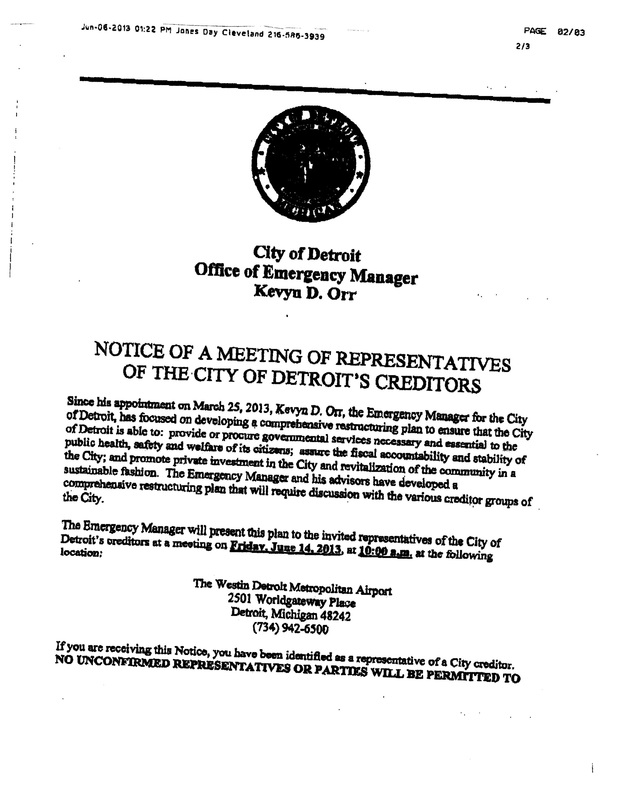 As Emergency Manager, Kevyn Orr is mandated under the law to guarantee the payment of debt service to the banks. Any talk of “renegotiating the debt service” by Orr is a sham to cover up his real job, to gut City services and sell off City assets on the banks’ behalf. In contrast to mandating payment of debt service, Orr is empowered under the law to break every contract that benefits Detroit’s workers and residents. The banks owe us billions of dollars for the destruction they have caused! They must be made to pay for the reconstruction of our communities! The City of Detroit should immediately place a Moratorium (halt) on all debt service payments to the banks. We need to restore and expand City services, not see them gutted. In Jefferson County, Ala., JPMorgan Chase was forced to forgive 80% of the county’s debt because of the bank’s fraudulent activity. We can win a Debt Moratorium here if we mobilize and fight back. Visit DetroitDebtMoratorium.org to view articles and documents on how the banks destroyed Detroit.